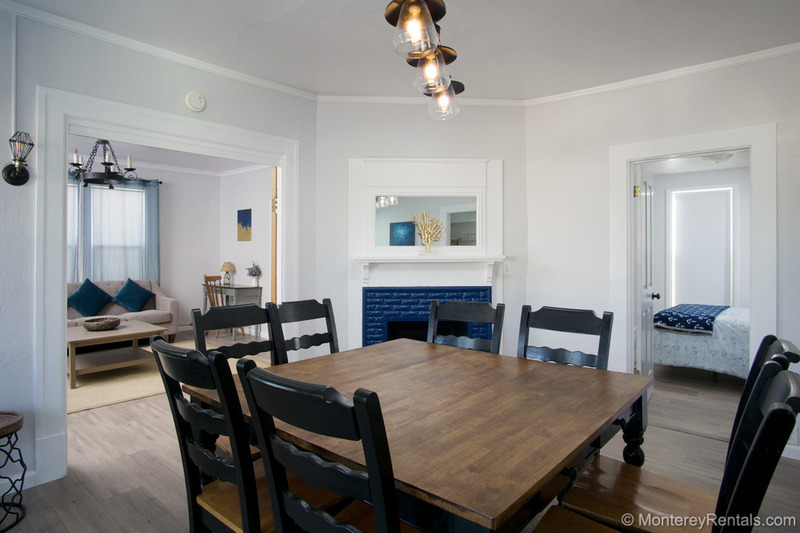 Serendipity A is a newly-renovated 3 bedroom/2 bath home in the heart of Pacific Grove. Accented with period lighting fixtures and nautical decor, the living room has a fold-out futon sofa for extra sleeping and a large flat screen TV. The dining area seats eight, and the sunny kitchen features a gas cooktop and griddle, a stainless dishwasher and refrigerator, and quartz countertops. The outdoor patio has a table for 6 and a barbecue. A compact master bedroom has a private bath with a walk-in shower lined in grey marble. The second and third bedrooms share a bath with a shower/tub. This classic home is an easy walk to shops and restaurants—and just a few minutes to the ocean and the coastal recreational trail. Note: A one bedroom/one bath studio apartment upstairs ("Serendipity B") is rented separately. Just a few blocks walk to the heart of Pacific Grove, and a few minutes to Lover's Point Beach. Open floor plan on one level.